November 1941: Dad enlisted. Basic training in Grande Prairie, then went to Calgary for sorting. Mom met him in London, Ontario on July 7, 1942. Mom was nursing in a TB sanatorium in Byron, a town five miles from London. Dad went to Fort Knox, Kentucky in September 1942 where he taught American soldiers how to service Sherman tanks. He served three months under General Patton. Asked mom to marry him August 20, 1942. Joined 4th Canadian Armored in London. Switched from Ordinance Corps to REMES (Royal Electrical Mechanical Engineers), Number M67470. 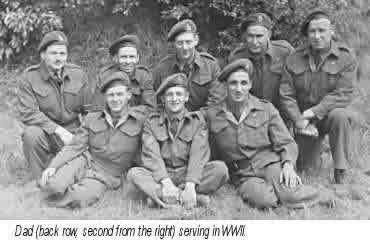 He returned from Fort Knox in April 1943, to Camp Borden, Ontario. He was an instructor on tanks. He instructed American soldiers how to fix American tanks in Fort Knox, and instructed Canadian soldiers how to fix Canadian tanks. He went overseas in June 1944. Didn’t expect it but the war had escalated. Mom suddenly got a letter from him from Nova Scotia. He came back in November 1945 after serving in five countries and having fought in the four countries of Belgium, Holland, France, and Germany. Came home for Christmas 1945. There was a mix-up with his discharge papers and he was released from Wainwright in March 1946. Dad told a story about people in Holland making thin soup out of tulip bulbs. People were eating tulip bulbs. The Germans took their food. The Dutch would have died of starvation. Dad helped liberate Eindhoven, a small village in Holland. There were 32 Canadians left alive at the end of this battle. Dad and the other surviving soldiers were given a scroll signed by the mayor of Eindhoven, which meant more to dad than medals. It was written in Dutch and English. 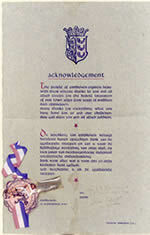 This scroll was given to him on September 18, 1944. He says the Canadian soldiers gave the Dutch all the rations they could. Dad also says that when he was in Germany they stopped their tanks to give their overcoats to Polish women working as slaves in Germany, digging up turnips in thin dresses. Uncle Edgar, one of dad’s elder brothers, fought in Italy, where the weather was very wet, which ruined his health. He had arthritis after that.